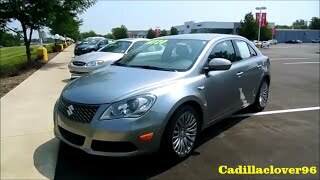 If you are looking for a quality sports sedan at a more than a reasonable price then you should seriously consider the all-new 2012 Suzuki Kizashi. The classy sports car has already received numerous accolades since it was first unveiled in 2010. The Kizashi was the recipient of the Auto Pacific’s Vehicle Satisfaction Award and also topped the midsize car segment in the APEAL study conducted by JD Power & Associates. 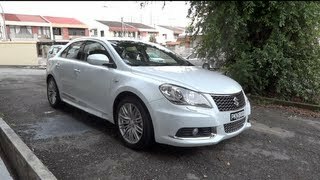 Under the hood, the 2012 Kizashi is powered by a 2.4-liter inline four-cylinder Dual Overhead Camshaft (DOHC) engine unit which can generate a decent 185 HP and 170 lb-ft of torque for the wheels. The fuel efficiency is greatly improved as the engine unit had a 10:1 compression ratio and an over square bore/stroke ratio. The transmission of power to the wheels is handled by a six-speed manual gearbox. One can also opt for the Continuously Variable Transmission (CVT) which reduces the power output of the engine to 180 HP but greatly improves the mileage of the vehicle. The Kizashi models have an optional upgrade of Suzuki’s revolutionary intelligent All-wheel Drive (i-AWD) system that when greatly improves the cornering ability of the sports car and also enhances the traction during low-friction situations.Suzuki has made a smart move by reducing some of the unnecessary optional upgrades for the Kizashi Sport GTS model with manual transmission. The Kizashi S and Sport GTS Automatic are the models which have received no major equipment changes. 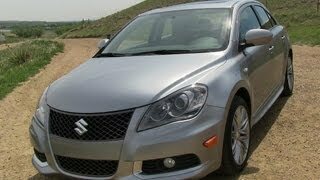 All the different models of Kizashi will be built and assembled at Suzuki plant in Sagara, Japan. The most amazing feature of any Suzuki car is the zero-deductible, fully transferable; seven-year/100,000 mile limited powertrain warranty offered on all automobiles manufactured by Suzuki. This instills confidence in the consumer about the high standard of quality offered by Suzuki Motors. BREA, Calif. – Recognized as the highest ranked vehicle among midsize cars in the JD Power & Associates' APEAL study as well as the top sedan in AutoPacific's Vehicle Satisfaction Awards for the second consecutive year, and receiving a Best Buy designation from Consumers Digest, among other prestigious automotive accolades, the Kizashi has earned the credentials to back up the premium without the premium claim American Suzuki Motor Corp. (ASMC) made when its sleek and stylish sport sedan was first introduced in 2010. For 2012, the Kizashi returns as the anchor of Suzuki's versatile vehicle lineup, helping move the brand upscale without abandoning the company's traditional emphasis on content and value. The Kizashi and Kizashi Sport receive minimal changes for the new model year. While the S trim receives no new equipment, the SE trim level is enhanced with an available leather option package adding power leather seats, (both driver and front passenger) and heated front seats. Both S and SE models also will offer the new Crimson Red Metallic exterior color. 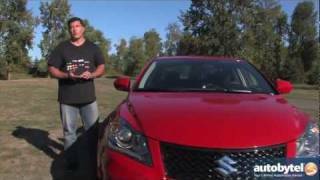 Suzuki has repackaged the Kizashi Sport GTS with manual transmission, eliminating the sunroof and power driver's seat options for increased performance and enhanced value; however, the Kizashi Sport GTS with automatic transmission remains unchanged for 2012. As with all retail 2012 Suzuki automobiles and light trucks, the Kizashi and Kizashi Sport are backed by America's #1 Warranty: a 100,000-mile/seven-year, fully transferable, zero-deductible powertrain limited warranty. 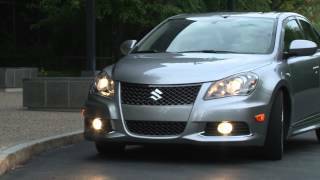 Built at Suzuki's manufacturing facility in Sagara, Japan, the 2012 Kizashi is equipped with a 2.4-liter DOHC inline four-cylinder engine. Benefiting from an oversquare bore/stroke ratio and 10:1 compression, the new Suzuki powerplant delivers 185 horsepower (@ 6,500 rpm) and 170 lb-ft of torque (@ 4,000 rpm) with the manual transmission. When mated to the performance-tuned Continuously Variable Transmission (CVT), the otherwise identical powerplant delivers 180 HP (@ 6,000 rpm). The responsive inline four is connected to a six-speed manual transmission for heightened performance in the low gears, while affording relaxed – and economical – cruising capability in the higher gears. Also available is a performance-tuned CVT that delivers both the driving experience and fuel efficiency today's consumers demand without compromising the character preferred by driving enthusiasts. That character is enhanced with available paddle shifters, optimizing driver control regardless of speed or driving environment. With the Kizashi, Suzuki distinguishes itself by delivering a dynamic and exhilarating driving experience, validated on Germany's Autobahn, Switzerland's Alpine hairpins, the cobblestone roads of rural England and the legendary Nürburgring. An exceptionally rigid steel unibody with a reinforced front suspension and a multi-link rear suspension constructed with embedded aluminum allows for crisp, nimble handling with excellent stability, a sophisticated ride and reduced chassis vibration. Engineered from conception to be all-wheel-drive capable, the Kizashi offers intelligent all-wheel-drive (i-AWD), a system with highly advanced controls that evokes and promotes a natural sense of driving enthusiasm and safety. Kizashi's sophisticated braking system offers standard four-wheel disc brakes and includes suppliers such as Akebono, a world-leader in noise, vibration and harshness (NVH) and a leading brake supplier for Japan's famed bullet trains. Kizashi's next-generation i-AWD system is a rare option in its class, as this performance feature is more often found among luxury offerings. Engineered to provide outstanding traction in inclement weather, the sophisticated all-wheel-drive system delivers both enhanced traction in low-friction situations and enhanced cornering capabilities. Activated by the driver, the system sends power to the rear wheels immediately upon acceleration. Torque split – up to 50:50 front/rear – remains dependent on several factors, including wheel slippage, throttle and steering input. Offered in combination with Kizashi's i-AWD is an advanced electronic stability control system, adding an additional layer of driver safety. In the event of vehicle oversteer (when the rear wheels lose traction while cornering), the synergetic vehicle dynamics control activates the AWD system to transfer driving force from the rear wheels to the front and helps inhibit rear wheel skid. At the same time, the system provides additional steering assist, making it easier for the driver to countersteer (i.e., to turn into the direction of the skid). The 2012 Kizashi retains a long list of standard safety equipment including class-exclusive standard eight airbags; electronic stability program; an anti-lock braking system with electronic brake-force distribution; and a tire pressure monitoring system. Additionally, the 2012 Kizashi and Kizashi Sport meet the new, higher-speed front crash standards that take effect in 2012, as well as the rigorous side barrier and side-pole crash standards that will take effect in 2014. Better visibility is achieved with standard projector beam headlights, supplemental side-mounted signal lights, fold-down rear headrests, available rear sonar and the newly-introduced backup camera. Further enhancing driver confidence, the Kizashi also offers a reinforced rigid chassis for added stability and control. Suzuki has taken advantage of its expertise in the compact car segment to efficiently execute spacious interior proportions that afford comfort and practicality while minimizing wasted space. Along with cabin proportions that reward Kizashi drivers and passengers with comfort and roominess, Suzuki provides a contemporary, upscale interior feel (including standard sport seats) in line with the vehicle's on-road performance characteristics. Driving enthusiasts will appreciate Kizashi's sporty, elegant and informative instrument panel, while consumers seeking a luxury sedan will be pleased with the vehicle's available leather seating and premium quality materials rivaling those of upscale competitors. The Kizashi also offers extensive sound insulation to help suppress road, tire and wind noise. Available premium leather is supplemented by three-stage heated front seats and a three-position memory program for the driver's seat. In addition, both cloth and leather seating benefit from Suzuki's attention to detail, including French seams, hard cover rears and high-density, low fatigue foam. Other premium choices include ambient overhead and footwell lighting, felt flocked glove box and center console storage tray, soft-woven headliner and A-pillars and leather door pull-straps – all standard. For those wanting high-tech beyond the engine compartment, the Kizashi's interior delivers by the megabyte. Beginning with standard SmartPass™ keyless push start system, the Kizashi also offers iPod®1 connectivity and optional streaming audio via Bluetooth®2 (in Sport GTS and Sport SLS models only), as well as a USB port that can also keep your music player charged (available on all models). Enjoying a standard level of equipment fully appropriate to its near-luxury aspirations, the Kizashi's base S model exceeds any traditional definition of 'base' with standard push button start, sport front seats, automatic dual-zone climate control with passenger rear vents, electronic stability control, eight airbags and integrated chrome dual exhaust tips. For those Kizashi customers wanting more in the way of comfort and composure, the Kizashi SE offers a standard CVT transmission; 235/45-18 tires mounted on alloy wheels; a 10-way power driver seat with three-position memory program; cruise control and a leather-wrapped steering wheel, shift lever and parking brake lever. New for 2012 is the SE Leather Edition, which includes power leather seats for both the driver and front passenger and heated front seats. Sport models include a more muscular front fascia with chrome accents and lower grille; body side sill extensions; lower body side molding with chrome accents; a trunk mounted spoiler; custom lightweight 18-inch alloy wheels and a 10mm lower ride height that provides a combination of improved aerodynamics and a lower center of gravity for enhanced performance and sharper handling. On the interior, Kizashi Sport models get a distinctive sport steering wheel with perforated leather grip and contrasting stitching in the shifter boot and parking brake boot as well as on the leather seats when equipped with the sporty black leather interior. The Sport GTS offers either a six-speed manual or CVT transmission with paddle shifters; unique Sport lightweight alloy wheels; fog lights; a 425 watt Rockford Fosgate®3 audio system pushed through an eight-channel, 10-speaker system, including a subwoofer and advanced digital sound processor and available integrated Bluetooth hands-free calling with audio streaming. Kizashi's top-tier model, the Sport SLS, brings newly-added standard navigation, as well as leather appointments; three-stage heated front seats; a four-way power passenger seat; HomeLink®4 universal garage door opener; rain-sensing windshield wipers; rear parking sensors; exterior heated mirrors; an automatic day-night mirror; automatic on/off headlamps and available XM Satellite Radio®5. 1 iPod is a trademark of Apple Inc., registered in the United States and other countries. 4 HomeLink is a registered trademark of Johnson Controls. 5 XM Satellite Radio is a registered trademark of XM Satellite Radio, Inc.